L-arginine (ARG) is an important amino acid for both medicinal and industrial applications. For almost six decades, the research has been going on for its improved industrial level production using different microorganisms. While the initial approaches involved random mutagenesis for increased tolerance to ARG and consequently higher ARG titer, it is laborious and often leads to unwanted phenotypes, such as retarded growth. Discovery of L-glutamate (GLU) overproducing strains and using them as base strains for ARG production led to improved ARG production titer. Continued effort to unveil molecular mechanisms led to the accumulation of detailed knowledge on amino acid metabolism, which has contributed to better understanding of ARG biosynthesis and its regulation. Moreover, systems metabolic engineering now enables scientists and engineers to efficiently construct genetically defined microorganisms for ARG overproduction in a more rational and system-wide manner. Despite such effort, ARG biosynthesis is still not fully understood and many of the genes in the pathway are mislabeled. Here, we review the major metabolic pathways and its regulation involved in ARG biosynthesis in different prokaryotes including recent discoveries. Also, various strategies for metabolic engineering of bacteria for the overproduction of ARG are described. Furthermore, metabolic engineering approaches for producing ARG derivatives such as L-ornithine (ORN), putrescine and cyanophycin are described. ORN is used in medical applications, while putrescine can be used as a bio-based precursor for the synthesis of nylon-4,6 and nylon-4,10. Cyanophycin is also an important compound for the production of polyaspartate, another important bio-based polymer. Strategies outlined here will serve as a general guideline for rationally designing of cell-factories for overproduction of ARG and related compounds that are industrially valuable. L-arginine (ARG) is a semi-essential amino acid that is important for medicinal and industrial applications. ARG is known to stimulate secretion of growth hormones , prolactin , insulin  and glucagon , promote muscle mass , enhance wound healing  and as a precursor for nitric oxide . Physiological importance of ARG supplementation is further raised by the important roles of nitric oxide in cardiovascular and neurological systems . For many important applications of ARG, its industrial level production has become an important task. It can be produced by microbial fermentation at an industrial scale  as for other amino acids such as L-glutamate (GLU) , L-lysine (LYS) , L-tryptophan (TRP) , L-valine (VAL) , L-threonine (THR)  and L-alanine (ALA) . For these amino acids, model organisms such as Corynebacterium glutamicum  and Escherichia coli  have been widely used as production hosts, while ARG production has been performed using B. subtilis  and C. glutamicum . It has been almost six decades since ARG production has been explored and studied using microorganisms. As in the cases for other amino acid production, random mutagenesis has been used in order to obtain efficient producer strains . However, random mutagenesis is problematic due to the unwanted genomic changes introduced. Thus, much effort has been exerted to develop strains through metabolic engineering. Systems metabolic engineering now allows construction of efficiently performing cell-factories for the microbial production of not only amino acids but also bio-fuels ,, pharmaceuticals , bio-plastics , platform chemicals - and even silk proteins . It is powered by rapidly advancing tools and continuously accumulating genetic and molecular information. It also aims to develop strains based on optimization of the entire bioprocess from strain design to industrial level cultivation. Its strategies include deletion of competing pathways , strengthening upstream pathways for increasing precursor pool , engineering transporters  and fine-tuning expression levels . Systems metabolic engineering approach has been successfully applied in order to rationally design ARG producer strain for the efficient industrial level production which can be potentially engineered to produce ARG derivatives as well . Systems metabolic engineering strategies can also be used for producing ARG-related compounds, such as L-ornithine (ORN), putrescine, and cyanophycin that share common pathways. ORN is a non-proteinogenic amino acid that has shown to improve athletic performance along with ARG and L-citrulline (CIT), another intermediate metabolite in the ARG biosynthetic pathway . Putrescine is a four-carbon diamine platform chemical that can be incorporated into various polymers such as nylon-4,6 and nylon-4,10. Cyanophycin can be used to produce polyaspartate which is another bio-polymer for various technical applications. 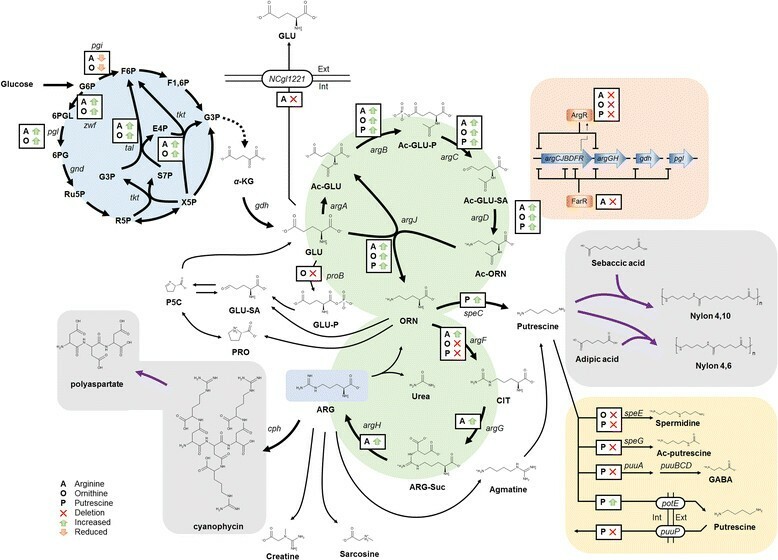 However, efficient metabolic engineering for such compounds has been limited by incomplete understanding on ARG biosynthesis even with the publically available genome sequences . Here, we review the three major pathways for ARG biosynthesis in prokaryotes including the recent discoveries. We also discuss various strategies applied to engineer strains for the efficient production of ARG, ORN, putrescine and cyanophycin using recently established examples. In prokaryotes, there are three major biosynthetic pathways for ARG; “linear”, “recycling” and the “new” pathways (Figure 1) ,. Each pathway is comprised of eight enzymatic steps from GLU and the major differences in these pathways are in that different genes are involved for conversion of N-acetylornithine (Ac-ORN) for further downstream reactions toward ARG . In the linear pathway (Figure 1A), Ac-ORN is converted to ORN by acetylornithinase (AOase; encoded by argE) , whereas in the recycling pathway (Figure 1B) this is catalyzed by a different enzyme, ornithine acetyltransferase (OATase; encoded by argJ) . In the third pathway, which has not been named, ORN is bypassed and instead N-acetylcitrulline (Ac-CIT) is formed by acetylornithine carbamoyltransferase (AOTCase; encoded by argF’, Figure 1C) . While certain aspects of the pathway components are still under debate, they are undoubtedly important in ARG biosynthesis and metabolic engineering purposes. Representative ARG biosynthesis routes in prokaryotes. (A) The linear pathway, (B) the recycling pathway and (C) the newly discovered pathway for the ARG biosynthesis are shown. Dashed line indicates feedback inhibition by ARG on the first (NAGS) (A) and second (NAKG) (B) committed steps in the pathways. Blue arrows indicate argE used in the linear pathway (A). Orange arrows indicate argJ used in the recycling pathway (B). Green arrow indicates argF’ used in the newly found pathway (C). ARG catabolic pathways are also shown. Ac-GLU, N-acetylglutamate; Ac-GLU-P, N-acetylglutamyl-5-phosphate; Ac-GLU-SA, N-acetylglutmate-5-semialdehyde; ARG-Suc, L-argininosuccinate; GLU-SA, L-glutamate-5-semialdehyde; P5C, 1-pyrroline-5-carboxylate. The asterisk indicates putative NAGS that has not been characterized in many organisms. In the linear pathway (Figure 1A), GLU is converted to acetylglutamate (Ac-GLU) by N-acetylglutamate synthase (NAGS, encoded by argA) which is inhibited by ARG through negative feedback regulation ,. Sequential catalytic reactions catalyzed by the next three enzymes, N-acetylglutamate kinase (NAGK, encoded by argB), N-acetylglutamate semialdehyde dehydrogenase (encoded by argC) and N-acetylornithine transaminase (encoded by argD), which are common in the three pathways (Figure 1), yield N-acetylornithine (Ac-ORN) . The next step, which distinguishes the linear pathway from the other two pathways, is deacetylation of Ac-ORN by AOase to yield ORN ,. The next and final steps are carried out by ornithine carbamoyltransferase (OTC or OTCase, encoded by argF), argininosuccinate synthase (encoded by argG) and argininosuccinate lyase (encoded by argH), which finally yield ARG . This pathway has been found in a few species such as Myxococcus xanthus  and E. coli . In many other prokaryotes including Geobacillus stearothermophilus (formerly Bacillus stearothermophilus) ,,, Thermotoga neapolitana , Pseudomonads , Neisseria gonorrhoeae  Streptomyces coelicolor  and C. glutamicum (formerly Micrococcus glutamicus) ,, ARG is synthesized via the recycling pathway and many aspects remain unknown herein (Figure 1B). The recycling pathway is regarded as more evolved and economical than the linear pathway and is “recycling” in the sense that the acetyl group deacetylated from Ac-ORN in the fifth biosynthetic step (similarly as in AOase) is re-used to acetylate GLU in the first committed step (similarly as in NAGS) of the pathway (Figure 1B). The OATase involved in the recycling step is either monofunctional or bifunctional depending on the species. For example, the OATase from G. stearothermophilus  and N. gonorrhoeae  is bifunctional and accepts both Ac-CoA and Ac-ORN as substrates to acetylate GLU, whereas that from S. coelicolor only accepts Ac-ORN as a substrate and considered monofunctional . However, many of monofunctional OATases are mislabeled as bifunctional and some are still being corrected . For example, the OATase from C. glutamicum which had been known to be bifunctional for decades ,,- has been re-considered as monofunctional -, while that from C. crenatum remains bifunctional . For species such as S. coelicolor, the OATase is characterized. However, NAGS has not been identified in this bacterium, while new classes of NAGS are continuously being discovered for other species . For example, the novel type of NAGS (C-NAGS)  encoded by cg3035 from C. glutamicum adds to the diversity of NAGS including (1) the classical NAGS (as in the linear pathway), (2) the bifunctional OATase (as in the recycling pathway), (3) ArgH(A) fusion types (argH-argA fusion) , and (4) the short versions of NAGS (S-NAGS) . Additionally, for species that have both NAGS and OATase such as G. stearothermophilus  and N. gonorrhoeae , there is a functional redundancy and the NAGS function is regarded as anaplerotic to replenish Ac-GLU ,. Moreover, another distinctive feature of this pathway is that NAGK reaction instead of NAGS reaction is negatively regulated by ARG ,,,. In the newly discovered pathway (Figure 1C), AOTCase from Xanthomonas campestris transfers carbamoyl group from carbamoyl phosphate to Ac-ORN to form Ac-CIT . Here, the formation of ORN is bypassed and ArgE deacetylates Ac-CIT to yield CIT. While the details of this pathway, as with the linear and recycling pathways, have not been fully explored, C. glutamicum and its related species with the recycling pathway are recognized as the organisms to most efficiently produce ARG. In terms of the chromosomal genetic organization, ARG biosynthetic genes are diversely organized in different species, and that from C. glutamicum has been studied the most. In C. glutamicum, the argCJBDFRGH cluster is organized into two operons (argCJBDFR and argGH)  and transcription of these operons are regulated by ARG , ArgR  and FarR , while the putative argA (cg3035, encoding C-NAGS) is separated from this cluster ,,. FarR regulates transcription of the arg operon by binding to the upstream of argC, argB, argF and argG genes ,. FarR additionally controls the ARG biosynthesis by binding to the upstream of the gdh gene encoding glutamate dehydrogenase which converts α-ketoglutarate (α-KG) into GLU . Similarly, ArgR, a global regulator, binds to argC and argG promoters to control ARG biosynthesis  and the degree of down-regulation is increased by ARG  but its binding affinity decreases by L-proline (PRO), which can be considered as a stimulator for ARG biosynthesis . Additionally, other strains have different chromosomal organization in the ARG operon. For example, it is partially clustered in the order of argCJBD in the chromosome for gram-positive bacteria such as G. stearothermophilus and S. coelicolor ,, while the bipolar organization of argECBH is found in gram-negative bacteria such as E. coli -. Initial approach to produce ARG at industrial scale began with random mutagenesis of microorganisms (Table 1). Mutants selected based on their resistance to antimetabolites and other analogues such as canavanine (CVN) ,, homoarginine , arginine hydroxamate (AHX) ,, 6-azauracil (6 AU) , 2-thiazolealanine (TA) , and sulfaguanine (SG)  have been used in early attempts to overproduce ARG. Mutations were induced by radiation , or treatment with mutagen such as N-methyl-N’-nitro-N-nitrosoguanidine (NTG) ,. The rational for this is to confer higher tolerance of ARG to microorganisms and to remove feedback inhibition by ARG . Historically, the random mutation approach had been used in various prokaryotic and eukaryotic strains including B. subtilis ,,, Serratia marcescens , Micrococcus sodonensis , Norcadia corynebacteroides , N. rubra , Saccharomyces cerevisiae , Candida tropicalis , C. glutamicum , C. crenatum , Brevibacterium flavum , B. ketoglutamicum , C. lilium , Arthrobacter paraffineus  and Microbacterium ammoniaphilum , to produce ARG. The trend later shifted toward using GLU overproducing C. glutamicum strain and its related species C. crenatum as base strains, which led to industrial level ARG titers. More importantly, the random mutation method is now used in synergistic combination with high-throughput molecular tools which enables systems metabolic engineering for industrial microbial strain development. Strains that have been reported to produce ARG, ORN, putrescine and cyanophycin are listed in the order of year for each compound. The relevant genetic information and production titers are shown. All cyanophycin production titers are given in a different unit scale (w/w %) than the rest which are given in g/liter. 5HUR, 5-hydroxyuridine; TRA, triazolealanine; 6FTP, 6-fluorotryptophan; 2TU, 2-thiouracil; 5FU, 5-fluorouracil; NIM, polyoxyethylene stearylamine. The strategies for rationally designing ARG overproducer typically consist of (1) removal of feedback inhibition, (2) overexpression of the biosynthetic genes (e.g., the arg operon) and/or removal of the repressors (e.g., argR and farR), (3) increasing NADPH pool required for ARG biosynthesis, (4) increasing carbamoyl phosphate pool by overexpression of carAB operon and (5) deletion of exporter for GLU encoded by NCgl1221. For example, reverse engineering approach was taken to the wild-type C. glutamicum ATCC 13032 strain for deleting argR and introducing A26V and M31V mutations in ArgB in order to alleviate feedback inhibition . This is an important study because it presented the first genetically defined and not randomly mutated strain for ARG production and the engineered strain produced 52 g/liter of ARG . Plasmid-based engineering system has also been explored. Overexpression of a bacterial hemoglobin from Vitreoscilla in C. crenatum SYPA 5–5 for increased dissolved oxygen availability led to the production of 35.9 g/liter ARG . Plasmid-based overexpression of the argCJBDFRGH cluster or argJ alone in C. crenatum SYPA 5–5 also led to enhanced ARG production, reaching 45.3 g/liter or 42.4 g/liter, respectively ,. A possible explanation for little difference in ARG titer here despite the different number of gene overexpression is probably because different cultivation conditions were used (e.g., different temperatures). Along the same line, a recent systems metabolic engineering study led to a very successful production of ARG at the industrial-scale . C. glutamicum ATCC 21831 was initially treated with CVN and AHX in order to increase its ARG tolerance and subjected to stepwise strain development. The argR and farR genes were deleted in order to relieve negative regulation on ARG biosynthesis. Next, in order to improve the NADPH pool, the pentose phosphate pathway (PPP) flux was enhanced by reducing the pgi expression through replacing ATG start codon with GTG, and overexpressing the major PPP operon consisting the tkt, tal, zwf, opcA and pgl by replacing the native promoter with the strong sod promoter. Finally the promoters for carAB and argGH operons were also changed in order to optimize fluxes toward the ARG biosynthesis and the Ncgl1221 gene, encoding the GLU exporter, was deleted. As a result, the final constructed strain produced 92.5 g/liter and 81.2 g/liter of ARG at the laboratory-scale and at the industrial-scale fermentations, respectively . This work is a good example of systems metabolic engineering for developing a microbial strain capable of overproducing ARG to the level and performance suitable for industrial-scale production. The ARG-derivative, ORN, has also been produced by microbial fermentation. Both the strategies of random mutagenesis  and systems metabolic engineering have been employed for developing strains (Figure 2). In rationally designing an ORN producer, knocking out the competing branches to redirect carbon flux to ORN pathway is an important and common strategy. Specifically, the strategies of PRO supplement , ARG supplement , vector-based overexpression of argCJBD , NCgl1469 overexpression , overexpression of rocG from B. subtilis , ΔargF -, ΔproB ,,, ΔspeE ,, ΔargR ,-, ΔNCgl2399 , ΔNCgl2905 , and Δkgd  have been employed for developing strains for ORN overproduction (Table 1). Systems metabolic engineering strategies. The metabolic engineering strategies used for the construction of microbial strains producing ARG, ORN, putrescine and cyanophycin are shown. Increased and decreased gene expression levels are shown in green and orange arrows. Purple arrows indicate reactions carried out by chemical means. The pgi encodes phosphoglucose isomerase, zwf encodes glucose-6-phosphate dehydrogenase, pgl encodes 6-phosphogluoconolactonase, gnd encodes 6-phosphogluconate dehydrogenase, tkt encodes transketolase and tal encodes transaldolase. Gene deletion is indicated with red crosses. GABA, gamma-aminobutyrate; Ac-putrescine, acetyl-putrescine; G6P, glucose-6-phosphate; F6P, fructose-6-phosphate; F1,6P, fructose-1,6-bisphosphate; 6PGL, 6-phosphogluconolactone; 6PG, 6-phosphogluconate; Ru5P, ribulose-5-phosphate; R5P, ribose-5-phosphate; G3P, glyceraldehyde-3-phosphate; X5P, xylulose-5-phosphate; S7P, sedoheptulose-7-phosphate; E4P, erythrose-4-phosphate; A, ARG; O, ORN; P, putrescine. The strategies for the development of ORN producers are similar to those employed for ARG producers except auxotrophy rescue by supplements is additionally used. Here, ΔargF and ΔproB are often included in order to disrupt OTCase and gamma-glutamyl kinase, respectively -. Although this strategy leads to higher ORN titer, it makes the strain auxotrophic for ARG and PRO since their biosynthesis is disrupted ,. Another common strategies are deletion of the repressor (ΔargR) ,- as in ARG strain cases, and overexpression of the biosynthetic genes (e.g., argCJBD) using plasmids . Overexpression of putative biosynthetic genes can also be a strategy for ORN production. It has been reported that overexpression of putative NAGS encoded by NCgl1469 leads to increased ORN production  while others claim Ncgl1469 as diaminopentane acetyltransferase . It is possible that Ncgl1469 potentially encodes a broad-substrate acetyltransferase that has not been characterized in detail. The TCA cycle flux can also be reduced by deleting 2-oxoglutarate dehydrogenase complex (ODHC) for the enhanced production of ORN . Increasing the NADPH pool also improves ORN production. The use of B. subtilis rocG which encodes NAD-dependent glutamate dehydrogenase allows conversion of α-KG to GLU in an NADPH-independent manner and leaves more NADPH for ORN biosynthesis . Increasing the NADPH level can also be achieved by inactivating two putative gluconate kinases (gntK) encoded by NCgl2399 and NCgl2905 . Overexpression of the ATP-dependent NAD kinase encoded by ppnK also leads to enhanced ORN production, while overexpression of glucose-6-phosphate dehydrogenase encoded by zwf and 6-phosphogluconate dehydrogenase encoded by gnd does not do the same . A possible explanation is that plasmid-based overexpression of zwf and gnd causes cellular burdens because chromosomal-level overexpression has shown improvement in ORN titer . An indirectly associated pathway for spermidine biosynthesis can also be deleted for enhanced ORN production, yet the reason behind it has not been explained . Combining the aforementioned strategies, a recently developed strain was reported to produce 51.5 g/L of ORN . In this strain, the PPP flux was enhanced by changing the tkt promoter and the start codons of pgi and zwf. The argCJBD cluster from C. glutamicum ATCC 21831 was overexpressed and argF, proB and argR were deleted. Putrescine (1,4-diaminobutane) can be produced by metabolic engineering of ARG related pathways. The major chassis organisms that have been employed are E. coli  and C. glutamicum . While the putrescine biosynthesis pathway is not well known in C. glutamicum, it is a desirable host as it produces ORN efficiently and tolerates putrescine better than E. coli ,. Although putrescine biosynthesis can be alternatively achieved via agmatine pathway (Figure 2), the ODC pathway was shown to be more efficient than the agmatine pathway . In addition to the strategies employed for developing ARG and ORN producers described in prior sections, engineering the transporters are the additional strategies for designing cell-factories for putrescine production. Putrescine can be synthesized from ORN by a single reaction carried out by ornithine decarboxylase (ODC) encoded by speC (Figure 2). The ODC from E. coli is often used since the metabolic pathway in C. glutamicum for putrescine has not been identified . To develop a putrescine producing C. glutamicum strain, the arginine repressor encoded by argR should be inactivated as in the ARG and ORN overproducing strains ,. While disruption of OTCase is also a strategy for improving ORN pool, this makes the strain to become an ARG auxotroph . Here, the ARG auxotrophy caused by ΔargF can be overcome by introducing a plasmid expressing argF which is also fine-tuned . The use of this strategy is an example of plasmid-addiction system and it circumvents the undesirable use of antibiotic as well because cell viability becomes plasmid-dependent . While engineering of the putrescine transport system in C. glutamicum would further enhance its production, this strategy has yet been applied only in E. coli . Along with the overexpression of putrescine/ornithine antiporter (encoded by potE) and deletion of putrescine importer (encoded by puuP), the competitive and degradation routes were deleted in the putrescine producing E. coli XQ52 strain . Chromosomal deletion of puuA encoding glutamate-putrescine ligase, speE encoding spermidine synthase, speG encoding spermidine acetyltransferase, and argI encoding one of the monomers for OTCase improved putrescine production. The native promoters of the key biosynthetic genes (argECBH operon, argD and speC) were changed to stronger promoters and the repressor argR was deleted. The rpoS gene encoding the stress-responsive RNA polymerase sigma factor was also deleted, which led to the development of the final strain capable of producing 24.2 g/liter of putrescine . While the highest putrescine producing strain reported is so far E. coli, further engineering of ORN overproducing C. glutamicum strain will likely led to the development of a more efficient putrescine producer due to its high-tolerance to putrescine . Cyanophycin was first discovered more than a century ago in cyanobacteria as a carbon and nitrogen storage compound . Cyanophycin has been recently attracting attention because it can be chemically reduced to make polyaspartate. Polyaspartate is a completely biodegradable polymer , which can be used as a polyacrylate substitute, an additive polymer in the oil field , and as a polymer suitable for water treatments and medical applications . Additionally, cyanophycin can also be used to produce isotope-labeled ARG . Cyanophycin is composed of equimolar amount of ARG and L-aspartate (ASP). Cyanophycin synthetase encoded by cphA carries out the reaction of polymerizing ASP and ARG (Figure 2). Various strains including P. putida ,, R. eutropha ,,, C. glutamicum  and E. coli ,, have been employed for the production of cyanophycin through the heterologous expression of cphA from Synechocystis sp. PCC6803  or Anabaena sp. strain PCC7120 . Acinetobacter calcoaceticus , has also been used to produce cyanophycin using the endogenous cphA gene ,. The metabolic engineering strategies employed include the use of mutants incapable of accumulating polyhydroxyalkanoates ,,, plasmid-addiction system using eda , or dapE  deleted strains, and the use of CphA variant having C595S mutation . There was an interesting report on the use of 2-keto-3-deoxy-6-phosphogluconate aldolase encoded by eda, which is required in gluconate and fructose metabolism. The use of this gene for plasmid-addiction system in Δeda strain circumvents the need to use antibiotics in large-scale cultivation. The 30, 400 and 500 liter-scale bioreactors have been used for the large-scale production of cyanophycin, which was followed by successful purification; at the end, the titer corresponding to 750 g of cyanophycin with 75% extraction yield have been reported . With increasing volumes of biological information and availability of high-throughput molecular tools, systems metabolic engineering has become an essential strategy for developing microbial strains overproducing ARG, ORN, putrescine and cyanophycin. Systems metabolic engineering obviously requires thorough understanding of the metabolism and gene regulatory circuits towards the production of desired products. The strategies of knocking out the negative regulatory mechanisms, amplifying the fluxes of pathways towards the product formation, deleting the byproducts forming pathways, and increasing the exporters while reducing the importers have been combined to develop microbial strains capable of producing ARG and related products. Such engineering strategies have been successfully applied to rationally construct a high-performance strain which works efficiently not only at the laboratory-scale but also at the semi industrial-scale fermentation. New tools of systems metabolic engineering are continuously emerging. For example, further metabolic engineering of the strain based on the sRNA technology can be envisioned to rapidly develop high-level producers. The strategies described here will be useful for developing microbial strains capable of more efficiently producing ARG and related products, including not only those mentioned in this paper but also other derivatives including sarcosine, creatine, agmatine and creatinine. Authors thank Dr. H.U. Kim for critically reading the manuscript. This work was supported by the Technology Development Program to Solve Climate Changes on Systems Metabolic Engineering for Biorefineries from the Ministry of Science, ICT and Future Planning (MSIP) through the National Research Foundation (NRF) of Korea (NRF-2012M1A2A2026556).